Cooks Standard 6-Piece Stainless Steel Knife Set PRICE CUT!! 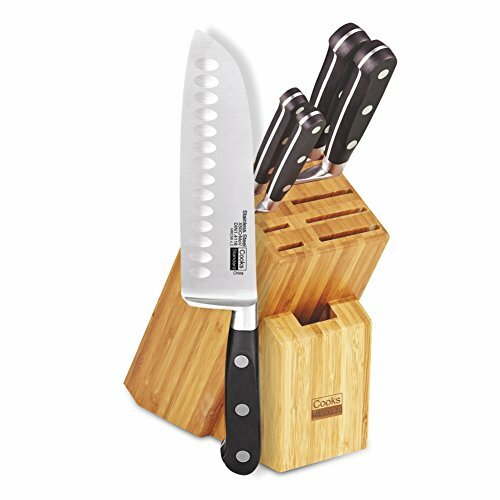 The Cooks Standard 6-piece stainless steel knife set with Expandable bamboo block for extra slots includes: 8 in. Chef's, 7 in. Santoku, 5.5 in. Serrated utility, 4.5 in. Utility, 3.5 in. Paring knife, and an Expandable bamboo block. Blade material is German engineered and made of stainless steel that provides strength and balance. Blades are sharp, stain resistant, and releases food easily. Full tang construction with 3 rivets provides durability. Handles are ergonomically designed for Comfort and polished for hygienic benefit. 9 slot bamboo block for storage is Expandable and holds wide and long knives. Not dishwasher safe, hand wash and dry immediately.